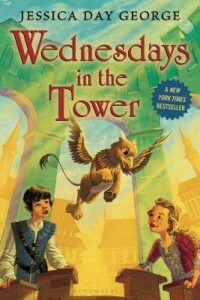 After zooming through the previous children’s book, Tuesdays at the Castle, I immediately picked up this sequel. The non-stop action continued, the likable characters are still there. There is a new evil character, who doesn’t quite make sense to anyone until the very end. It’s similar to the previous book but with a different set of complications for the children to deal with. I would say this lightweight fantasy book is particularly appealing to readers between 9 and 11. There is admittedly not that much depth or philosophy in this series of children’s books. Whether that matters or not depends on what your child is looking for. In this case, one is simply looking to be highly entertained and captivated by the intrigue of a story, and a problem to be solved. The author does a good job of setting up something that needs resolution, and makes us invested in the outcome because we like the characters so much. I have one reservation about this particular children’s book, and that is the lack of a conclusion at the end. The book ends with a cliffhanger, a teaser, for the next children’s book in the series. In my mind, that’s actually not a fair thing to do. It smacks of marketing rather than good writing, which is exactly what the author admitted when she presented the book at our school library. It’s unfortunate, as the entire rest of this children’s book is fine. It would have been better for it to resolve, and stand on it’s own. Sigh.